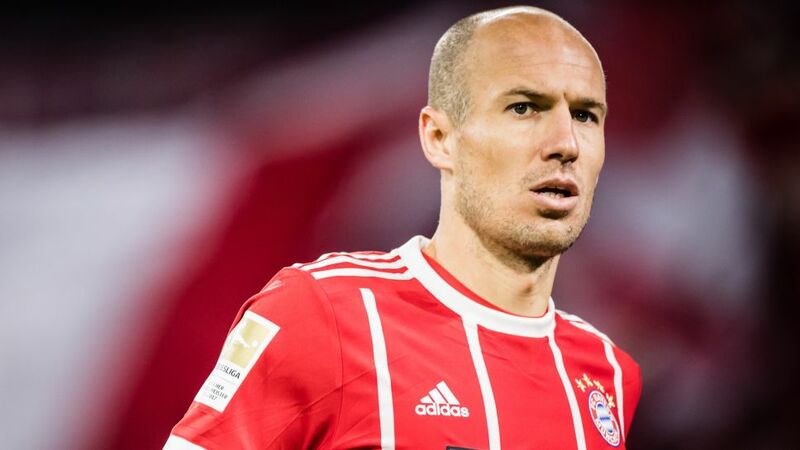 Bundesliga | Bayern Munich's Arjen Robben: "Games against Borussia Dortmund are always tough"
Bayern Munich's Arjen Robben (c.) has faced Borussia Dortmund more times in his career than any other club. Bayern Munich's Arjen Robben: "Games against Borussia Dortmund are always tough"
Almost halfway into his ninth season in the Bundesliga, evergreen Bayern Munich winger Arjen Robben has come to know perennial title rivals Borussia Dortmund like the back of his hand. The 33-year-old Dutchman has ten goals and five assists in 20 meetings with BVB to date, and famously broke Black-and-Yellow hearts with the match-winner in the 2013 UEFA Champions League final. bundesliga.com caught up with Bayern's Klassiker specialist for an exclusive chinwag ahead of Saturday's blockbuster at the Signal Iduna Park. bundesliga.com: What's the first thing that comes to mind when you think about Borussia Dortmund? Arjen Robben: I have many great memories, of course. It's always a good battle between both teams. I've been at Bayern for eight years now, this is my ninth season. When I first moved here they were not challenging at the top of the league, but now they are. It's always very competitive and there have been a lot of great games in the past. Robben: Yes, that was a while ago and a lot has been said about it. There are always emotions involved in the game and I missed a penalty and you can see the wrong reaction to that. He obviously shouldn't have reacted like that. We got our revenge in the Champions League final, though. That happens a lot in football, you usually reap what you sow. I was caught up in my own thoughts and obviously he shouldn't have done that, but it's OK.
Quiz: How well do you know Arjen Robben? Take the test! bundesliga.com: Is there a goal which is particularly special to you, apart from the obvious one – in the 2013 Champions League final? Robben: Yes, I'm lucky to have scored a few against Dortmund! The first goal in the 2014 DFB Cup final in extra time in Berlin stands out. And also in the 2013 DFB Cup at home, I think in the round of 16, or the quarter-final I scored the first goal. They were nice goals, but also important goals for us. bundesliga.com: What can you tell us about the coach? You probably know him better than we do! Robben: I don't know him personally. I've never worked with him or played against his teams. But you definitely get a sense of what he is about from the press and what he did with Ajax last season. But to judge a coach I think you have to have worked with him before so I can't really judge him. bundesliga.com: Do you think Dortmund are playing differently to last season? Robben: They have always been physical, strong and aggressive. They are dangerous on the counter attack. They have a lot of pace in their team. But they are playing differently I think, they turn defence into attack very quickly. Peter Bosz wants them to win the ball back within only a few seconds of losing it. That's what he asks of his team. bundesliga.com: You always give 100 per cent. Do you manage to find an extra few per cent in the big games in the Bundesliga? Robben: Not only in the Bundesliga, you have other big games in the course of a season. But I think the trick is not to do too much differently. Just to be well prepared. I look forward to these games. Maybe there is something extra but it is not always a positive thing. Sometimes you can be more nervous for an important game, but I get more excited! bundesliga.com: How is your relationship with returning coach Jupp Heynckes? What do you like about him? Robben: Very good, we have obviously already worked with each other. Several other players know him well so we know how he works, what he demands from his team as a team but also as individual players. It's important that he knows the team, he knows how the team works and that is exactly what we need at the moment.